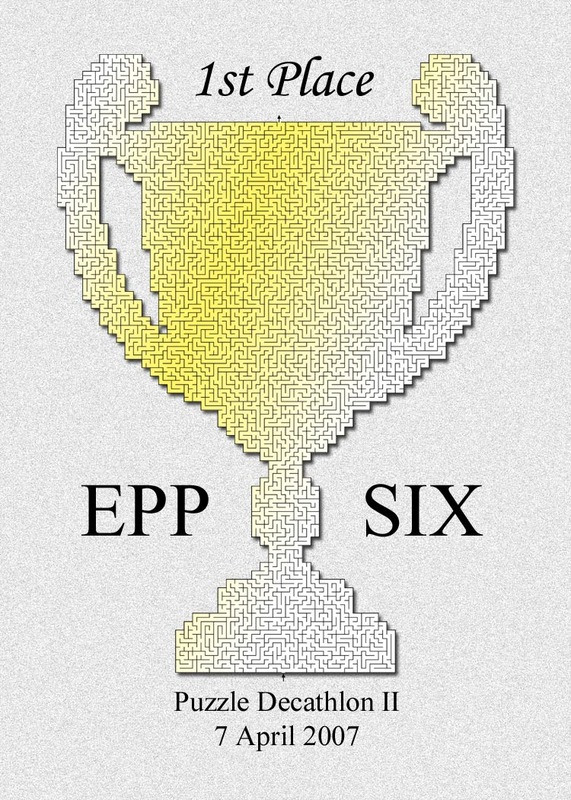 I'll start off by mentioning the hiccups and quirks that went along with this sixth Puzzle Party of mine. Overall the event was a great success, but there were a few problems early on. First, I goofed and accidently scheduled the Party for Easter weekend again (I did that for the first Decathlon as well). I was trying to dodge Spring Break weekends for Auburn University as well as Tax Day, and by doing so, I completely forgot about Easter again. Still, I had 22 Players participate (10 pairs on Saturday, 1 pair on Sunday), so I thank them all for attending on the holiday weekend. The next piece of insanity I had no control over whatsoever. In late March I was beginning to worry that come Party-day the weather was going to be blazing hot (our March was very warm here in Auburn). Um... no. Easter weekend managed to bring in a freak cold snap. The nights around Party-day were near freezing (literally), and the high temperatures were in the low 50s (about 30 degrees colder than the week before). Unfortunately, many of my puzzles were stationed outside, and even though it was a sunny day, warmer temperatures would have been appreciated by all. Once the party began at noontime, however, everyone jumped head first into the zaniness. A few typos were discovered in the puzzles, I accidently left out one word in a crossword-type puzzle, and in the third round one of the manipulative puzzles (was) broke(n). But, despite all of that, things moved forward, and by the end of the day everything was running smoothly. My smaller springtime decathlon parties are meant to be less taxing on me as the designer/organizer/host. and this proved to be the case again this year. I was tired by the end, but not exhausted. We started at noon, and we finished the last round at just past 5 o'clock (25 minutes per puzzles plus a five minute break in between). Pizza arrived at 5:30 and we all hung around, socialized, and I explained the tricks to solving most of the puzzles. I was very pleased with not only the variety of puzzles at this Decathlon but also how well I developed the scoring system for each challenge. It was a tight race for everyone involved (only 70 Points separated the first and last place teams), and no one really knew who was going to win until the very end. Below are brief explanations of the challenges that faced the players. The title was a cryptic reference to the phrase "Digits In A Rectangle" which, in turn, was a reference to another puzzle of mine, "Digits In A Box". 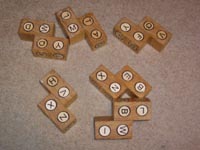 Basically, the Players had 10 polyform pieces, each representing one of the ten digits (0-9), and they had to lay them flat on the table and interlock them within the smallest area rectangle possible. No team found the optimal solution, but most were able to get some positive points based on the scoring scheme presented. This proved to be the most popular puzzle of the day. I liked it very much as well (and not just because it was a very easy puzzle to 'design'). 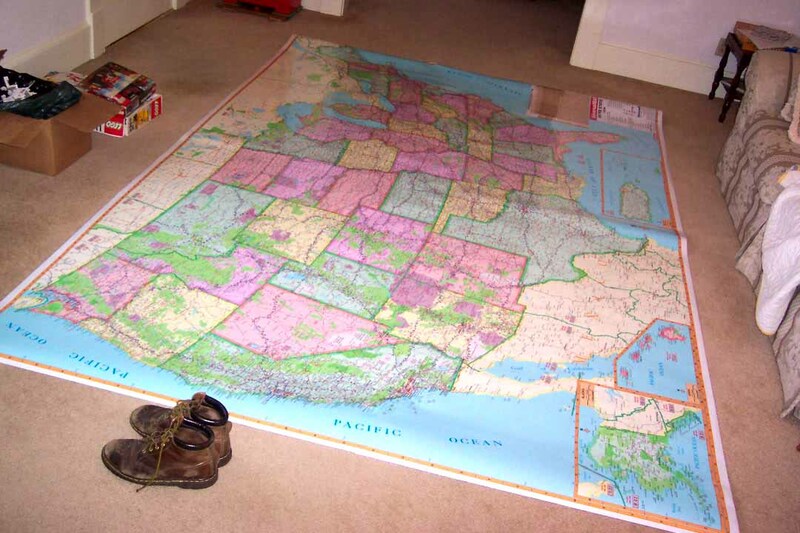 The puzzle used the giant U.S. map I have in my house. For each letter of the alphabet Players had to try to locate a city on the map the began and ended with that letter. Some of the best examples found included Huntington Beach (in California), Dauphin Island (in Alabama), and Yah-tah-hey (in New Mexico). Longer city names earned more points. I plan to post a 'best possible list' as soon as I analyze the map index fully. I really liked this manipulative puzzle, but, unfortunately, it was manipulated a bit too roughly in the third round of the Party and it broke. Since no team had yet solved it, I decided to just make this round a 'bye' round for Players (so technically this Party was a Nonathlon not a Decathlon, I guess). This is a pretty typical "Eric-Harshbarger-space-fillng-kind-of-puzzle". 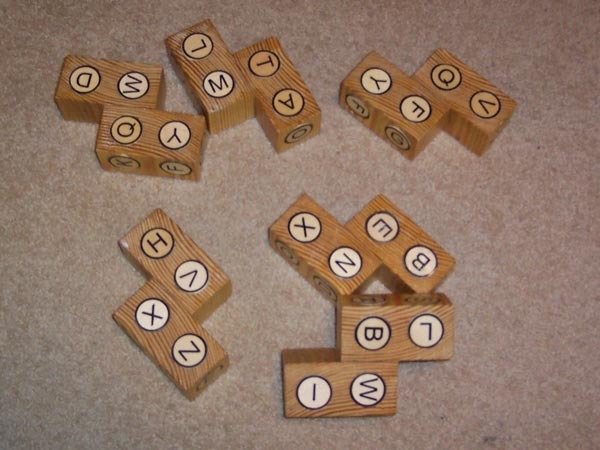 Players had to take 26 small rectangles based on the Braille Alphabet and place them within a rectangular playfield. As many as possible of the dots on the Braille pieces were to be aligned with black dots on the field. Bonus points were given if the perfect arrangement was found (accomplished by three of the teams). Most of the time people complain that my manipulative/assembly puzzles are too hard, but this one was solved by every team... maybe because there were not that many pieces involved. 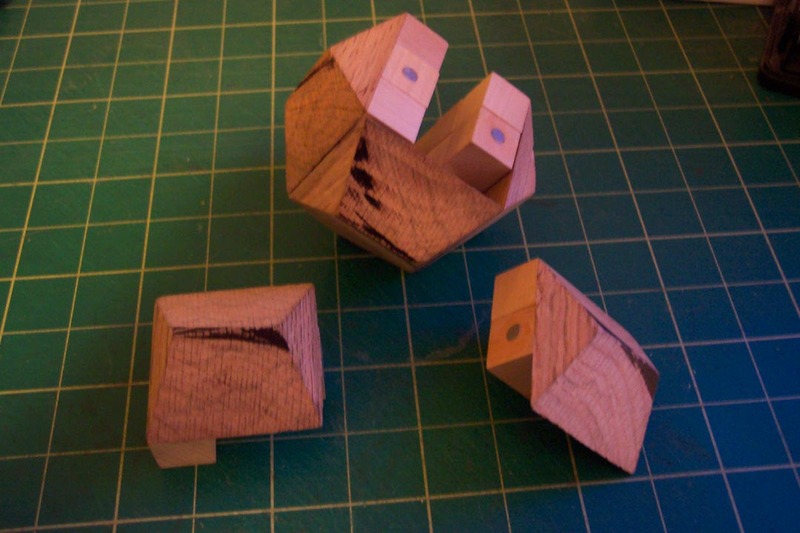 Six pieces had to go together to form a regular dodecahedron. It was a wooden puzzle with magnets that I had constructed about one year ago. Another assembly puzzle. this one proved much harder, and only one team solved it. The puzzle was built out of LEGO bricks and involved getting the seven red pieces positioned completely within the black 'cage' to form a perfect cube shape. The score was equal to: (100 - LENGTH OF LIST). The example above was 68 letters, so the score would have been 32. Can you find better? All of the teams did quite well. 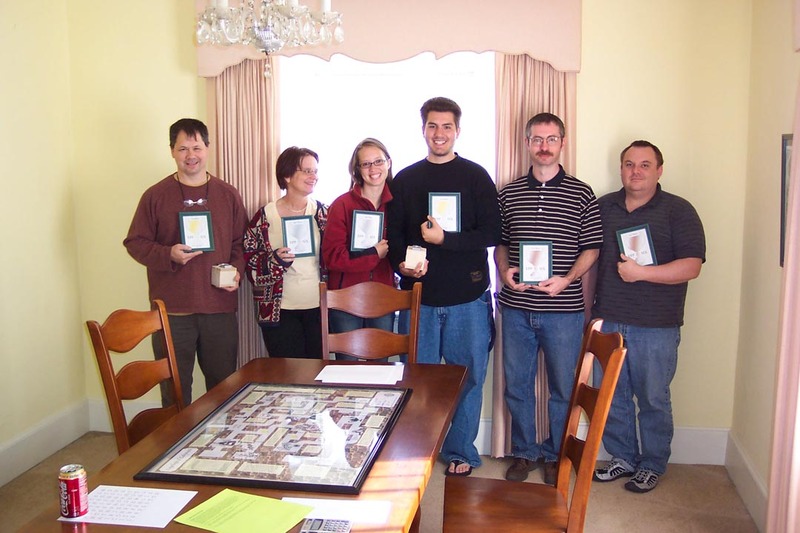 The wordlist used as reference was based on a slightly out-of-date tournament Scrabble list. I designed this insanely intricate poster-puzzle months ago. When I reviewed it a couple of weeks before the Party, I thought to myself, "there is NO WAY any team will finish this in 25 minutes." My prediction was correct... no team got more than the most basic score on it. It should have been at least a 60-minute puzzle. I knew there would not be adequate time to tackle it, but there was no way I was going to exclude the puzzle after the hours of work that had gone into making it. The best possible score is 100 points... see how long it takes you to figure it out. By the way, I 'appropriated' some of the images used from other sources... but since this was all for fun and games (and not for profit), I assume no one will really mind. Depsite the magnitude of the challenge, this was probably the most respected (and second most popular) puzzle at the Party. My only regret is that a little too late I thought of a much more 'clever' title for the puzle: WORLD OF WORDCRAFT. 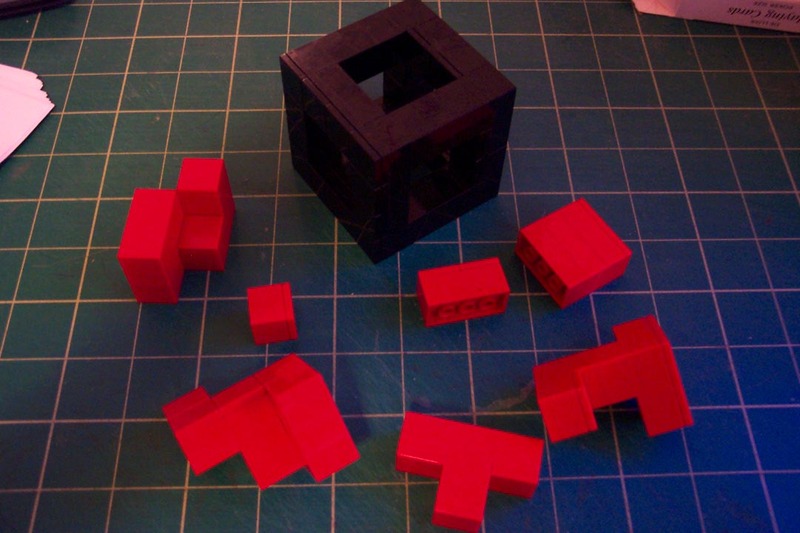 An assembly puzzle in which the finally 2x3x4 rectangle was to exhibit each letter of the alphabet xactly twice on its surface area. No team solved it, but afterwards, when I revealed a gimmick about the finally positions of the letters, it became quite easy to beat. A basic "wordfit/crossword" style puzzle in which Players had to fit as many of the fifty U.S. State names into a predefined grid-network. I accidently left out the grid-space for PENNSYLVANIA, so everyone got at least one point for free [grin]. I am finally repeating a format for one of my Parties! Spring 2007 will bring another one of my Puzzle Parties, and, as with a year ago, it will be a decathlon: ten puzzle events, each about half an hour long, with teams tackling the challenges in a "round robin" style. The only difference between the first decathlon and this one is that this one may be held over two days if there are too many teams for one day. There will, of course, be different puzzles as well. Teams will be of one or two players each. Other than that I make no restrictions (yes, Tim, you and Robert can be on the same team if you want). 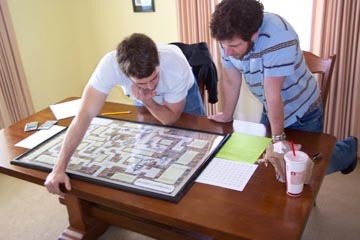 Teams should only show up on the day during which they will compete (to keep them from getting previews of the puzzles). The winning teams will not be announced until the end of the second day. Time: Noon, it will last 5-6 hours. The Decathlon will consist of 10 puzzles (I will have only one copy of each made). Each team will start at a different puzzle and have 30 minutes to try and complete it. After 30 minutes, time will be called, there will be a 5-10 minute break as I grade and reset the puzzles, and then each team will shift places so that they have the next puzzle to tackle in the next half hour. After ten half hour "rounds" each team will have attempted each puzzle. 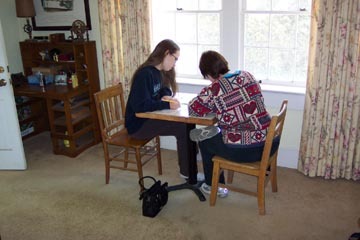 Scores will be kept track of throughout the day, and at the end, the highest score wins. I will award "gold", "silver", and "bronze" medals to the 1st, 2nd, and 3rd place teams. Pizza will be ordered for everyone as per tradition. There can be, at most, 2 people on a team. The types of puzzles (see below) will lend themselves best to small teams. Some of them might be easier to attempt with two people rather than a lone player, but I don't think this will be a huge advantage for teams-of-two.